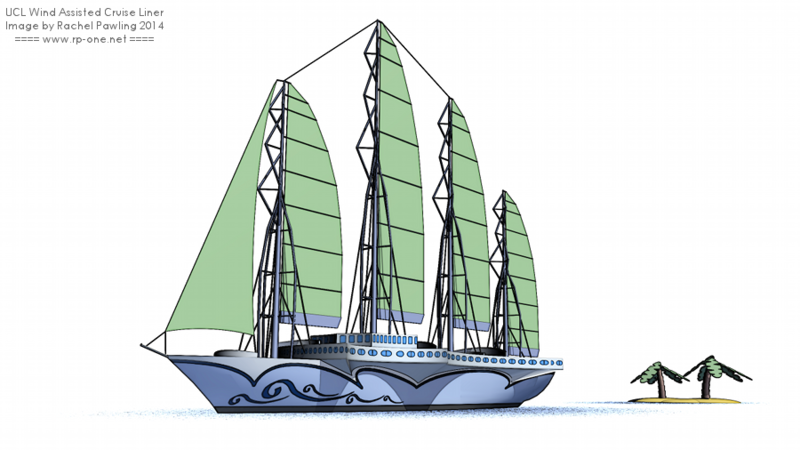 Ship designs are developed in the UCL Department of Mechanical Engineering for two purposes. Firstly, as part of the MSc Ship Design Exercise, a yearly group-based design project, and secondly as part of research projects in the Naval Architecture and Marine Engineering (NAME) and Design Research Centre (DRC) components of the Marine Research Group (MRG). This page illustrates some of the designs developed as part of these activities. A Trimaran Small Waterplane Area Central Hull (TriSWACH) destroyer design developed to investigate radical hullforms and future electric weapons. 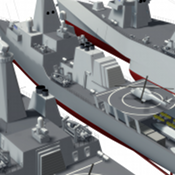 Weapons included a free-electron laser for area air defence and two 155mm railguns for long range surface warfare. The novel hullform offers improved seakeeping and greatly increased upperdeck area, with a penalty in calm-water resistance. 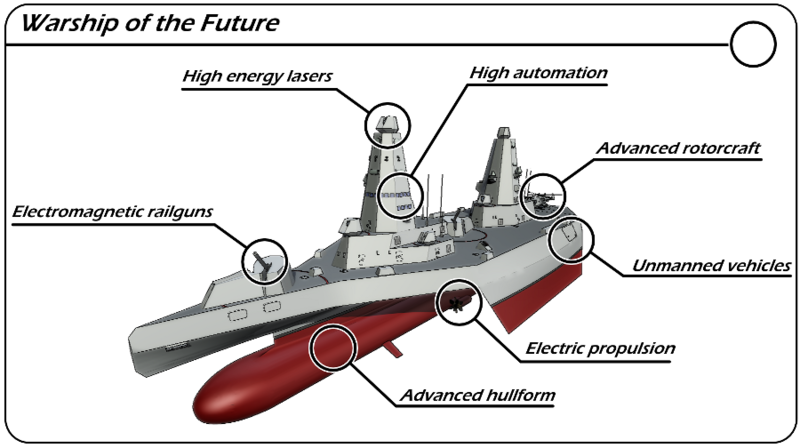 Reference: Andrews DJ, Bucknall, R, Pawling, R, Greig, A & McDonald, T, “The Impact of Integrated Electric Weapons on Future Warship Design Using Conventional and Unconventional Hullforms”, Engine as a Weapon (EAAW) 2011, IMarEST, London. 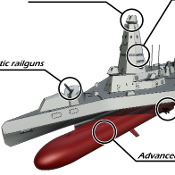 A 3000t mothership for Unmanned Surface Vehicles (USVs), to perform OPV duties. The six USVs are stored in a mission bay in the superstructure amidships, and launched and recovered by crane. The basic mothership capabilities are limited to supporting the USVs, and weapons for self defence (TETRAL and Small Calibre Guns). The large USVs have a semi-submersible configuration providing improved seakeeping at the expense of increased calm water resistance. Reference: Pawling, R & Andrews, DJ, “Large Unmanned Vehicles and the Minor War Vessel”, International Conference Warship 2013: Minor Warships, RINA, Bath, June 2013. 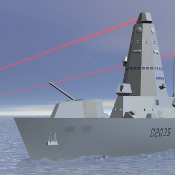 A 7000t destroyer using electric weapons, designed to similar requirements as the Type 45. 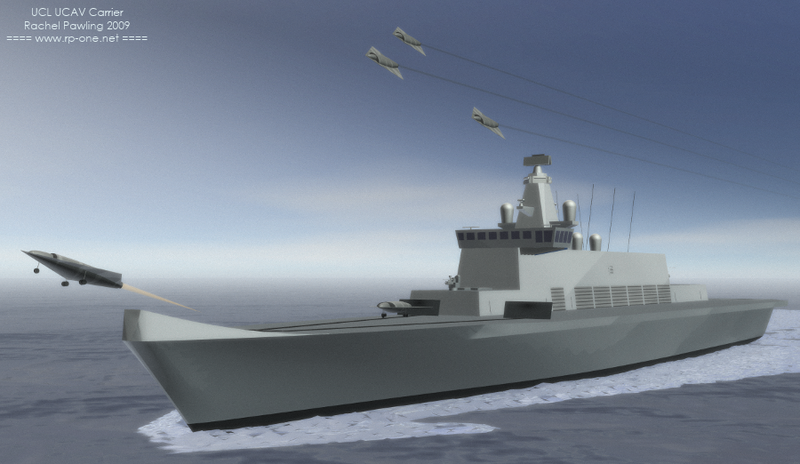 Weapons included a free-electron laser for area air defence and two 155mm railguns for long range surface warfare. A single 15t helicopter can be accommodated, with a flight deck amidships between the two superstructure blocks. 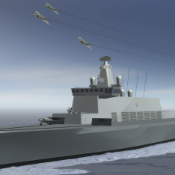 Reference: Andrews, DJ, Bucknall, R & Pawling, R J, “The Impact of Integrated Electric Weapons on Future Warship Design”, INEC 2010, IMarEST, Portsmouth. A 3000te mothership for Unmanned Surface Vehicles (USVs), to perform OPV duties. A Wind Farm Support Vessel, using a TriSWACH hullform for improved seakeeping and increased upperdeck area. 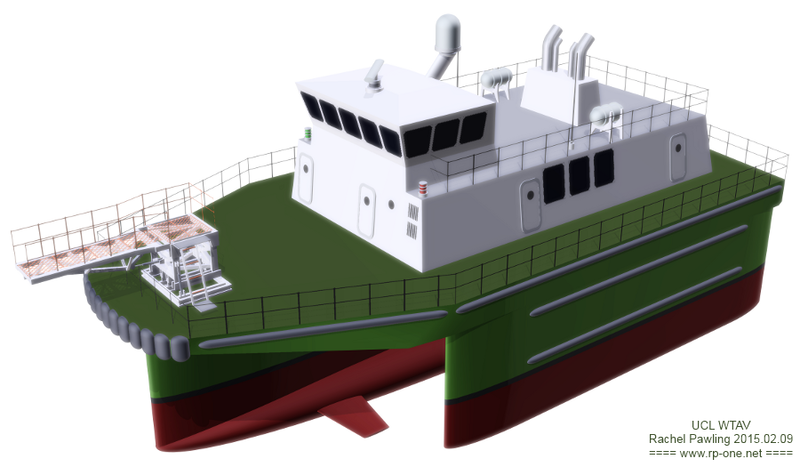 This small vessel can transfer crew and spare parts to offshore wind farms, operating from either shore or an offshore base or mothership (for deep-water farms). 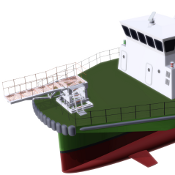 The design was developed to demonstrate the application of the Design Building Block approach to this type of vessel and provide a baseline for investigations of offshore windfarm support systems. 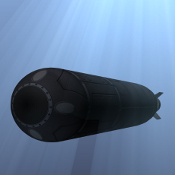 A 20t Unmanned Underwater Vehicle (UUV) using fuel cell propulsion, designed in the Design Research Centre as part of a study into possible future submarines using UUVs for their primary capability. 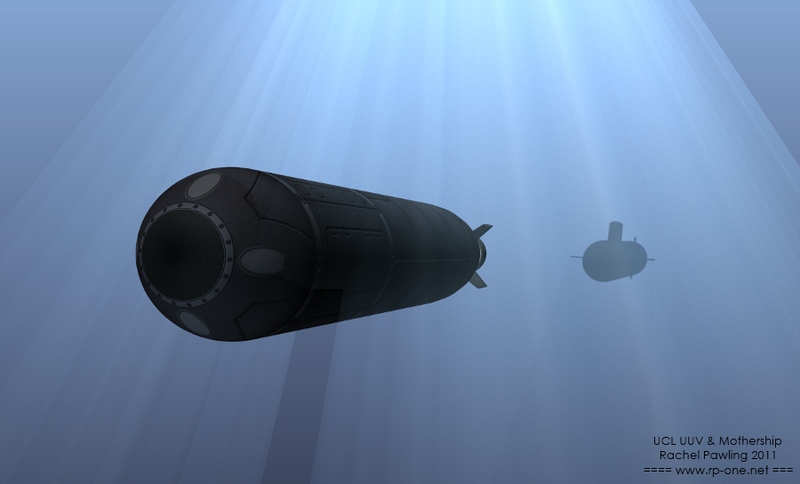 Several different mothership submarine configurations were developed to investigate the impact of this technology on future submarine design, which was subsequently taken up in an industry sponsored PhD. Reference: Pawling, R & Andrews, DJ, “A Submarine Concept Design – The Submarine as an UXV Mothership”, International Conference Warship 2011: Naval Submarines and UUVs, RINA, Bath, June 2011. A 7000te carrier for Unmanned Combat Aerial Vehicles (UCAVs), designed to carry out the deep strike and other roles requiring a small, dedicated fast jet aircraft. The carrier has an above deck hangar (in the superstructure) to keep the size of the vessel down and is equipped with basic self defence (CAMM and Small Calibre Guns). The UCAVs are launched using a combination of an electromagnetic catapult and a bow ramp, and are recovered vertically. Reference: Pawling, R & Andrews, DJ, “The Ship Design Challenge of Naval Unmanned Aerial Vehicles”, International Conference Warship 2009: Air Power at Sea, RINA, London, June 2009. 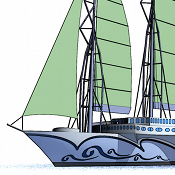 A Wind Assisted Cruise Liner - a 2014 UCL MSc student design for a small cruise liner with an extensive sail rig and Liquified Natural Gas (LNG) fuelled propulsion, offering an exclusive, low-emissions cruise experience. 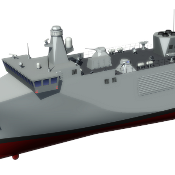 Three designs for an OPV with a mission bay for modular systems including Mine CounterMeasures and hydrographics. 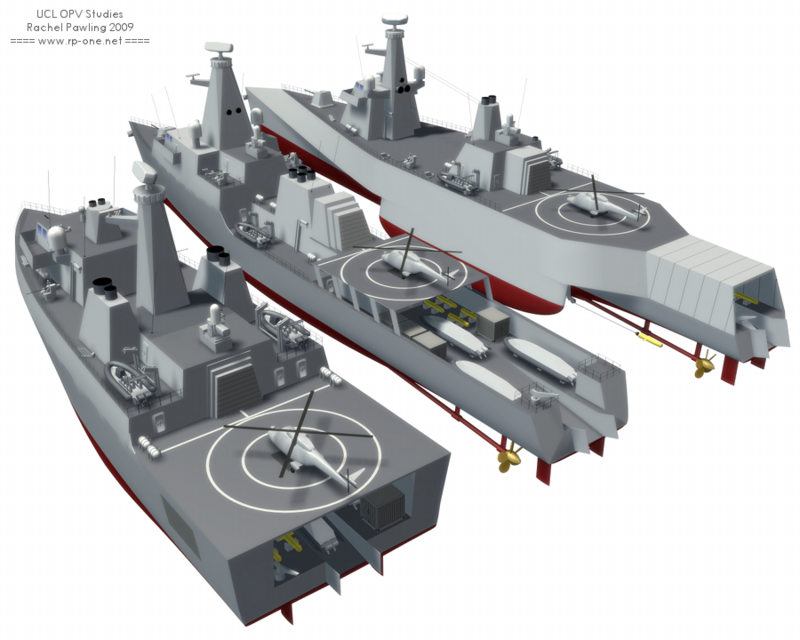 These vessels, each of approximately 3000t displacement, were designed in a consultancy activity for the UK MoD, to investigate alternative configurations for this illustrative requirement. From left to right, they are; a broad-transom monohull; conventional monohull; and trimaran. Reference: Pawling, R & Andrews, DJ, “Three Innovative OPV Designs Incorporating a Modular Payload for UXVs”, International Conference Warship 2010: Advanced Technologies in Naval Design and Construction, RINA, London, June 2010.